Dehumidification Technologies, LP has been serving our customers since 1993 and will continue to improve our business to keep them satisfied for years to come. Our team at DH Tech has over 80 years of experience in the industry. 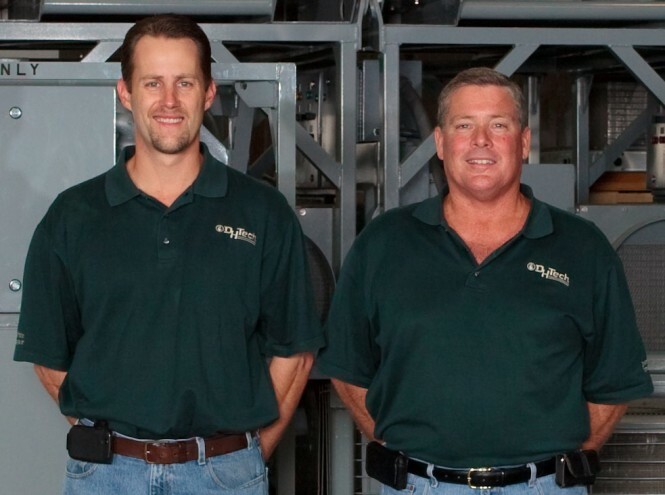 Owners Ken Armstrong and Brian Battle, national operations manager Rusty Burch, and our highly trained and experienced staff work together to take care of our customers. DH Tech’s desiccant and refrigeration-type dehumidifiers are available on a long or short-term rental basis as well as a direct sales basis. Our capabilities range from industrial to water damage emergency service construction drying. DH Tech has the locations, equipment, personnel and technology to serve you on time and under budget. DH Tech will deliver and set up the equipment at the project site to ensure that proper power supply and air movement calculations are correct along with regular consultations and monitoring until the job is completed. DH Tech’s corporate office is located in Houston, Texas along with 11 other offices to guarantee we will be on the job anywhere in the United States in a timely manner. Drying is a precise science that uses psychrometrics, material density data and the known effects of ambient conditions to enable DH Tech to take command of any project. The successful completion of tens of thousands of projects has proven that you have to have control before you can take control, and DH Tech can take control of any humidity or temperature situation. DH Tech’s management team are active members of NACE International, SSPC, ESI and the Coating Society of the Houston Area. These organizations assist DH Tech by staying knowledgeable of the latest expertise and standards of corrosion prevention and control. Ken Armstrong has previously served on the 2009 Board of Directors of the Coating Society of the Houston Area, and Brian Battle previously served as President.